"The Download" with Dana White is a UFC.com exclusive interview with the boss, covering everything that's in the news. This week Dana talks UFC 196 and about the main event between Conor McGregor-Nate Diaz and Holly Holm vs. Miesha Tate. UFC president Dana White remembers sitting at dinner for the first time with Conor McGregor, thinking to himself that if the Irishman could fight as well as he could talk he would be a superstar. White was absolutely right. That’s because McGregor, who takes on Nate Diaz in the main event of UFC 196 live on Pay-Per-View from the MGM Grand Garden Arena in Las Vegas, makes the fight game fun because he does his talking inside and outside the Octagon, White said. Not even Diaz, at 170 pounds on 10 days’ notice. As White said, McGregor will fight any man at any time. 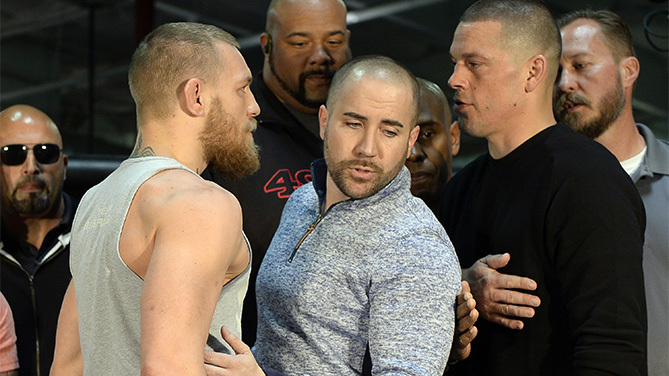 UFC 196 marks the fourth time in eight UFC fights that McGregor has embraced a late opponent change. This time, it’s Diaz who steps in, just over a year removed from being an afterthought in the UFC following a lengthy holdout. But since Diaz re-focused his efforts and dedicated himself once again to training, he’s looked like the best version of Nate Diaz that there’s ever been. White said that what makes the Diaz brothers so special is they command respect and people love them both of them. The moment UFC women’s bantamweight champion Holly Holm knocked out the iconic Ronda Rousey, everything changed. Holm became a star and turned the MMA world on its head. White is referring to Holm’s first title defense against veteran Miesha Tate in the co-main event. Tate has seen everything inside the Octagon over the course of her career and she knows what she’s good at. Tate won’t rush Holm like Rousey did, and with a smart game plan “Cupcake” has a shot to pull the upset. This will be Tate’s second UFC title shot, and an opportunity White said she must take advantage of. “A loss on Saturday will definitely – if Miesha should lose I’m sure it’s definitely going to have her questioning what’s next,” White said.